Looking up at the steeple of one of the oldest churches in the Indian Sub Continent. The steeple is widely believed to be also the tallest a church has in the region. 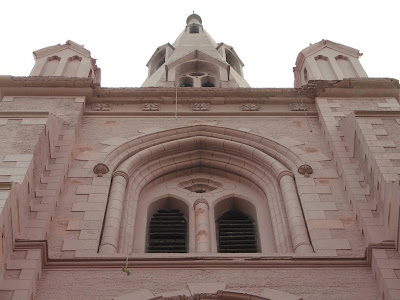 Built by Lt J.Hartley Maxwell of the british Bengal Engineers on 1st March 1852, The Holy Trinity Cathedral is beautiful with a lot of history, inside there are numerous plaques dedicated to the various british casualties during the the war of independence and the rest of the british Raj. Sialkot, Pakistan.